The Paceline is by far one of my favorite routines to coach during indoor cycle. Not only because I can vary it to get different results, but also because it introduces some real world cycling components to a group of uninitiated. They didn't teach us that in our Spinning® class. In the real world a paceline is what cyclists call their drafting formation that teams use to share the burden of driving through the wind. 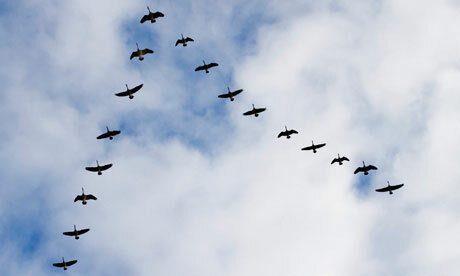 Let's back up a bit; ever see geese migrating? They fly in a V-formation so that they can "draft" off of the goose just ahead and slightly below them. With geese, the strongest takes the lead, and when he gets tired he swaps position with another to rest. In this manner the geese can fly much further (over 71% further) and faster than they could left to their own motivations. My favorite part about the geese comparison, and you can atest to this if you've ever seen them flying, is they're noisy. The geese in the rear of the formation are making all that honking noise to goad on the leader to fly faster; essentially talking smack. So the paceline in cycling performs much the same function. One cyclist, just inches away from the cyclist ahead of her, essentially getting an active recovery period while the lead cyclist plows through the wind resistance. So yeah, I know they didn't teach you this in your Spinning® certification class, but they did teach you that you could vary resistance and position AND that you can do combination movements as long as you don't do anything contraindicative. I coach pacelines in two different manners, but reality is they're both segments of a rotating paceline. Watching a rotating paceline you see a fast line and a slow line. 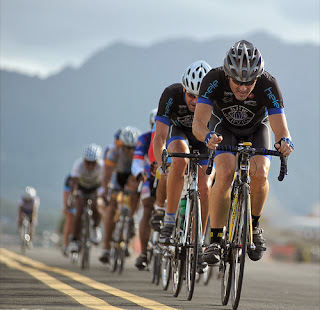 In the fast line each change results in you moving closer to the front, which equates to working harder. In the slow line each change results in you moving further from the front so your working less. or some variations of the theme. Let's break down the instruction set and then I'll explain how they relate to the paceline. The number is the duration in each position in seconds. I adjust my duration depending on what I want the heart rate to do. If I want the heart rate to climb quickly, I'll make the duration 15 seconds; climb slowly then 20 seconds. Average out to a no net increase, greater than 25 seconds. I find recovery with general populations to be around the 25 second mark; so short duration pacelines won't allow you to recover before the next exertion. For simplicity sake I encourage you to stay to 3 positions. Technically you could do the entire paceline in the saddle (looking more like what a real paceline would be, but since we're manually applying the resistance I think it works best to show distinct changes; rather than being subtle. The slow line means each change moves you further from the front with lessening effort. That would be something like the R - SF - F :25 instruction. Starting with a heavy resistance you're pulling the group for 25 seconds while performing a (R)unning with resistance move; 25 seconds later you take the edge off the resistance for a (S)tanding (F)lat and then finishing in the drafting position with a (F)lat before starting the entire cycle over. You could do a full paceline where you do a combination of both the fast and slow lines, IF you have cadence monitors. Making the Fast line 10rpm faster than the slow line. I have broken my room up into different groups where each group is performing a different stage of the paceline. A word of caution, this can be confusing for those unfamiliar so make sure to explain the cuing before hand. One that I've not had the opportunity to try because of my class size, but I've spoken with people in smaller studio's where they circled the bikes for the class. Then your next move is always the move of the person just to your left. 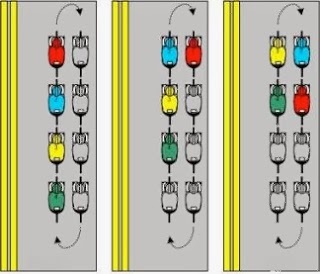 If their doing a (R) this time, at the next change you do the (R), resulting in a follow the leader effect. Be sure to explain what position your in and why you've change the resistance in the manner you did for your participants. This lets them understand the real world implications of what you're doing. I hope this post helps demystify some of my profile instructions, and even more important gives you something new and different to introduce to your classes; bringing a bit of road cycling into the studio.